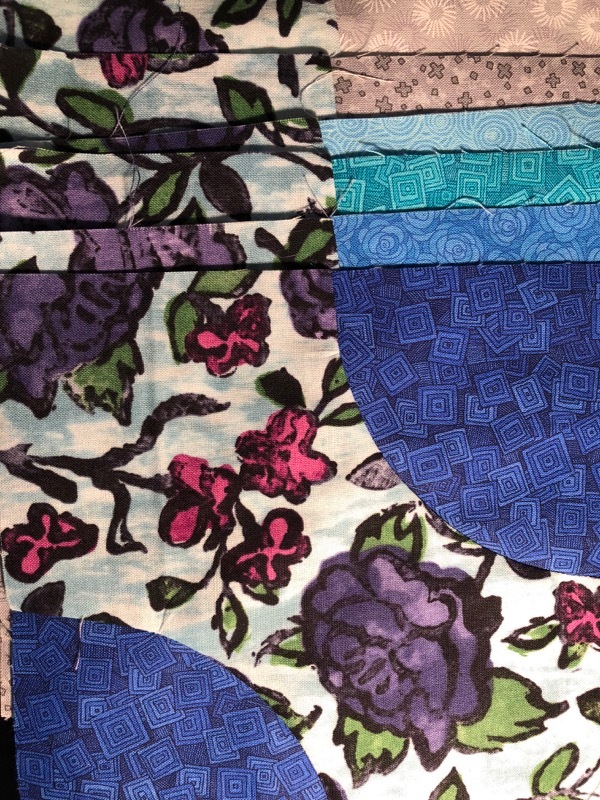 Random thoughts on fabric and quilting with Florabunda! It has been so much fun learning to use Floribunda! in quilts. Florabunda! pairs nicely with other designer lines in the RJR Fabrics catalogue. For instance, I think it pairs beautifully with Jamie Fingal’s Hopscotch line, an expansive and colorful array of low volume, super-fun prints. (Jamie is a Florabunda! 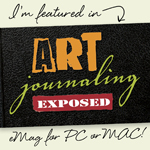 Blog Hop Celebrant and her work will be featured soon). I’ve made a bowtie quilt as my offering to the Hop (I will showcase this on the 16th), which combines both our lines. It feels good to know there are so many options to expand Florabunda!’s reach. 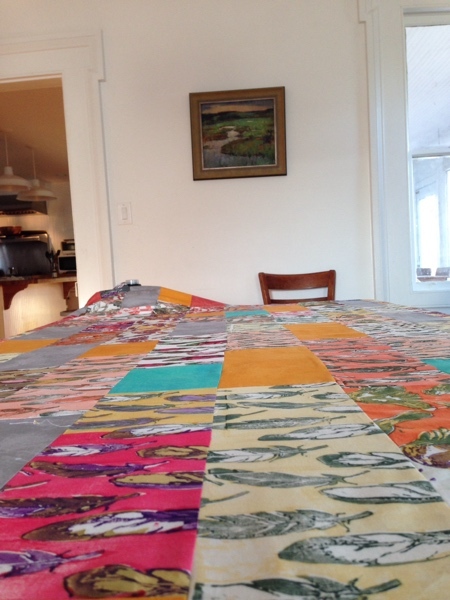 Over the course of the last few months, I have made three or four quilt tops using Florabunda! and I am learning so much. The prints compliment and contrast to one another in interesting ways. 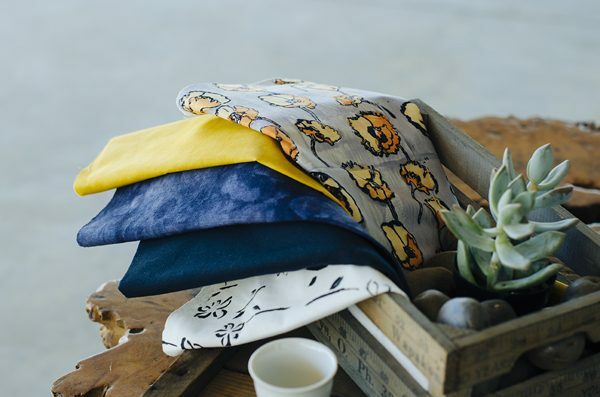 Its allowed me an understanding of what I might do differently in designing and printing my next portfolio of textile designs. 🙂 I also see where I might interject more value options in the single color prints/low volume prints. To go from designing, carving, cutting, mixing, printing, securing a commercial line of fabrics, THEN, being able to use them in quilts? Build preferences? Figure out how better the next line of fabrics? This is a dream come true. This is my dream. Over the years, I have convinced myself that I am not a quilter so much as a quilt artist, with an emphasis on the art part. I suppose this storyline used to help -perhaps it helped to bolster my identity and projected, intended artistic path. But this idea no longer supports me. 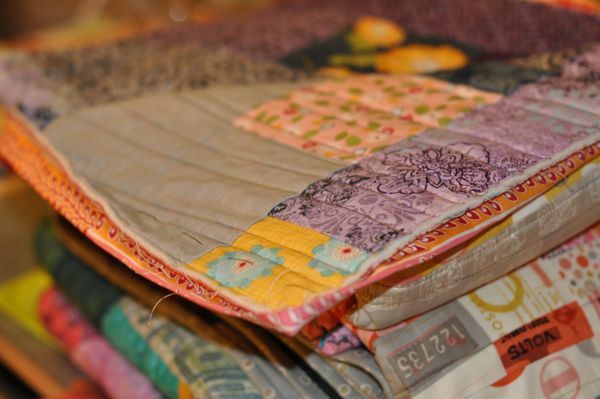 In walking this path, I placed barriers between myself and more traditional quilting. I told myself it was too difficult to follow a pattern. I told myself it took too long, I didn’t have the skills, I forgot the skills. I created barriers and closed myself in. And then, I felt constricted. Cut off. To break down this wall, I turned to Victoria Findlay Wolfe‘s books, which I have been perusing and rereading obsessively. I have also taken some of her one day workshops (and I want to take more), here in NYC. 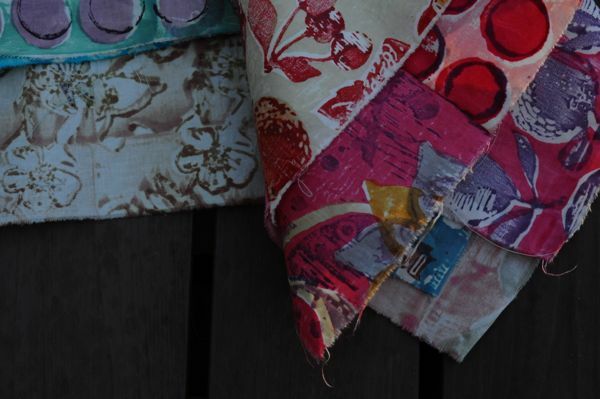 I connect with her ingenious, playful approach to using fabric, the manner that she reinterprets traditional layouts and quilt blocks, and her fearlessness of artistic expression in the medium. And I connect with her teaching style. I have taken the release of Florabunda! by RJR Fabrics as an opportunity to improve my quilting skill set, dust off my patience, and commit to learning to use the line effectively. 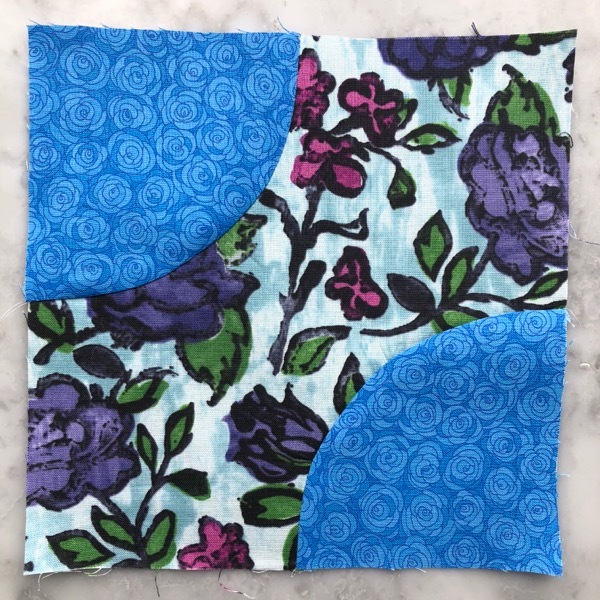 Using Victoria’s Bow Tie template, I cut a Fat Quarter bundle of Florabunda! combined with an array of Jamie Fingal’s Hopscotch collection to play around. Previously, I assumed sewing 1/4 circles would be far beyond my skill set. But, it isn’t. This is a methodical task, requiring three pins and Victoria’s motto of, “Floppy Toppy” as a reminder to sewing curved success. I look forward to seeing how this quilt top comes together. And I remind myself not to create impediments to enjoying all aspects of my own creative expression behind the sewing machine. When I was a child, one of my favorite books was called, We Were Tired of Living in A House. Much like it sounds, the children in the family, packed their bags and headed out to make house in a tree, on the beach and so on. Ever in my life as an artist has this concept been of great favor. I do everything in my power to Gather my Sew-plies, or bucket as the case may be, and hit the town. What better way to drink a bit too much coffee and get out of the apartment, than this. It has been pretty quiet here and today is the day to break that silence. A project I have been working on, with my good friend Carol Soderlund, is coming to fruition. And better still, we can now reveal, we are working with Pokey Bolton and Crafting a Life, LLC to bring this project to life! We are writing a book on multicolor printing using Procion MX dye, our favorite medium! My smile is so big, I can hardly stand it. Soon, some time soon, we will have a printed book to show for our efforts. And Crafting a Life, LLC is printing our book. Can I say, OMG? Pinch me, please! We are all quite excited to tell you about this project!! 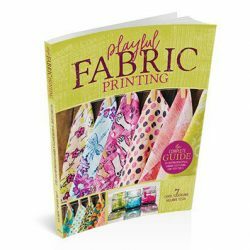 This book will discuss motif making, loose and formal repeat printing and many other printing techniques. And it will act as a printers workbook. The materials used to print the cloth are readily available; carving rubber, fun foam, stencil plastic and Thermofax screens. We present a simple method of working with color and gradation that is both unique and accessible. 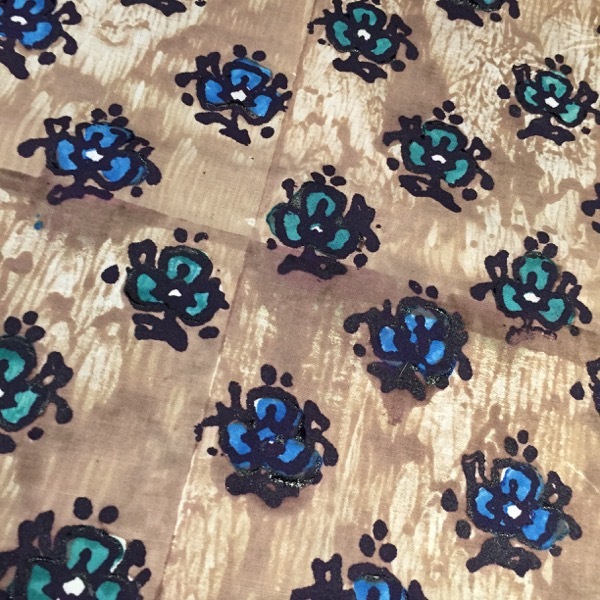 Basically, we have removed the learning curve related to mixing and using color and set the stage for you to begin printing your own unique textile designs with ease. We’ve been diligent in finding solutions for those who have little space, but are still drawn to expressing themselves creatively by printing unique and personalized cloth. And we present methods to enable you to print yardage too. To say this makes me happy is an understatement. To work with Carol is an honor. To have finally figured out how to print in repeat without a fancy studio or special equipment? Priceless. The fact that Crafting a Life, LLC and Pokey are supporting our efforts by printing, what I believe will be, hope will be, the surface design book of a generation? This is a complete and total blessing. As we come closer to day when you can hold this book in your hands, we hope you will visit our blogs and social media accounts. 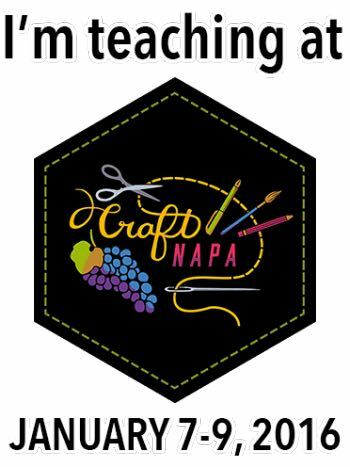 I will be printing and piecing a quilt top as blog content, with updates to my personal FB, my Melanie Testa-Artist page and my Instagram page. Last year I was given a glimpse into identifying too closely with yourself through the making of art. I had not previously been forced to assess the role that making art had in my life or that it was so closely identified with how I think of myself as a person. I lost my ability to connect with and do my art for months at a time, I have never been as blocked as this and I hope never to become blocked like this again. There were a few days when I threw my arms up and asked myself, ‘what and who are you without the ability to make?’ All my normal jogs and pushes didn’t work, trying out new media, going to museums, hanging out with friends, I did these things, but they did not lead me back into the making! 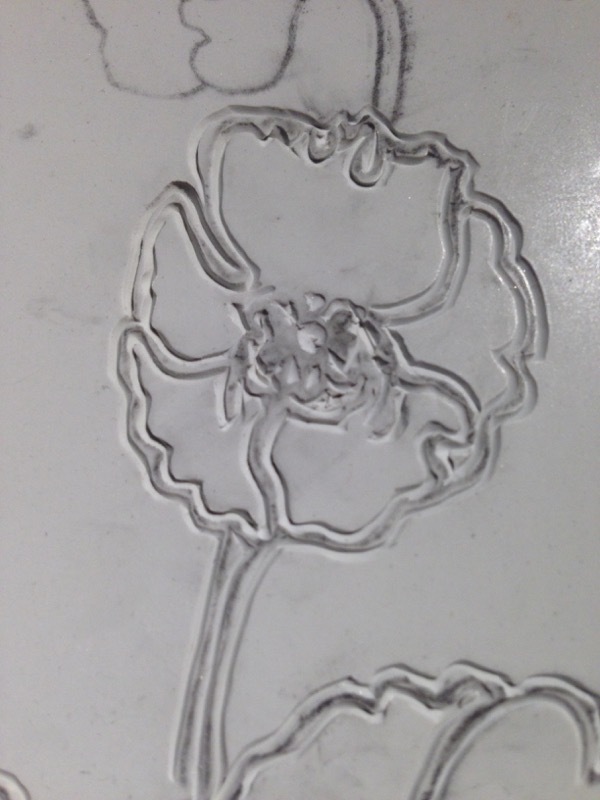 So, rather than to look at my art as a means to connect to self, I have decided that making is a fun thing I do. One of the many things I like to do. And sometimes, you just have to do those other things. Buying Dragon, my Thermofax machine, sure did help. That gave some extra luster to wanting to make the plunge and delve deeply into printing enough cloth to make something with. 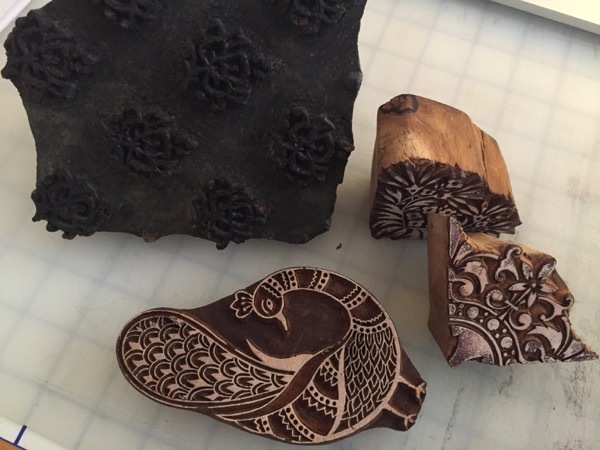 Rather than create new motifs, I looked to my collection of woodblock stamps for inspiration. These motif have the effect of being even more exciting to me because they are nothing like what I would design otherwise. This week, I hope to print some semisolids, some cloth that will allow for visual relief, a break from all the colorful clutter and motifs that you see here. All, while I revel in the fact that my creative drought has broken and I am able to return to doing the creative work that makes me happy. I may yet become blocked again. 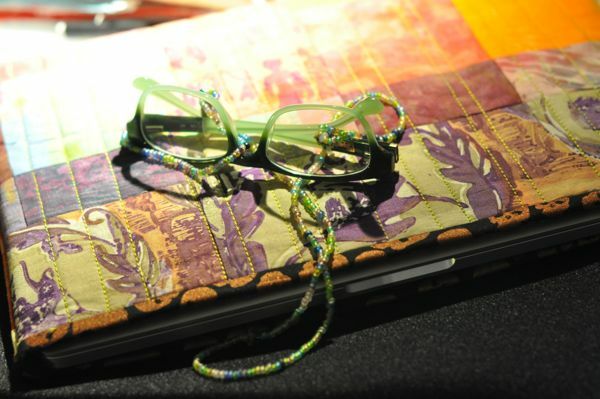 I may suffer a creative drought, where I wonder who I am without the ability to access my creative center, I hope not. But at least I will know, it does come back! Even if I just have to let it run its course. 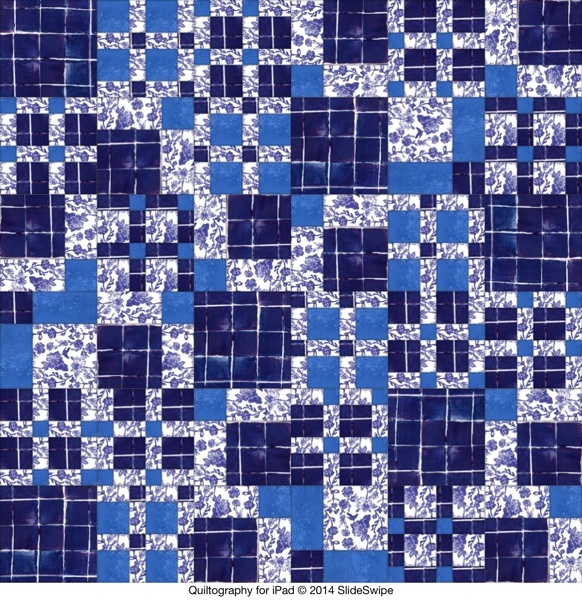 This is a very rough draft document that follows the tracking of making this quilt top. More updates to follow. Please, check it out. 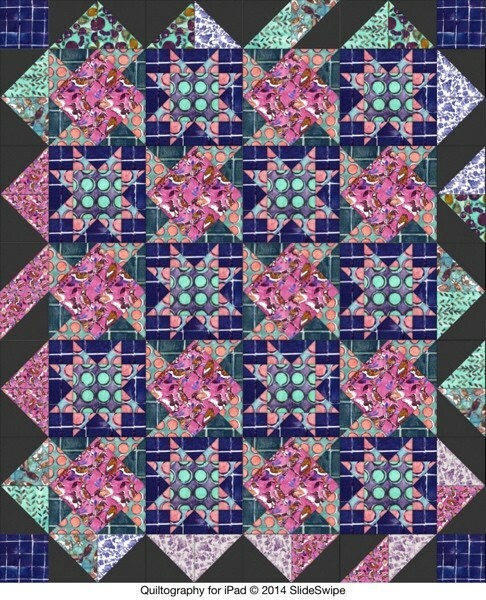 I found the Quiltography app just in time. I am a bit addicted. I love figuring out how to affectively use Meadowlark. And this app is robust, it is certainly a great and easy to use springboard. My line of fabrics at first glance is far reaching, this is not a match-matchy line. Rather it is cheerful, playful and eclectic and colorful. The patterns and color choices are like a rainbow, some reds, oranges and yellow, along with some blue, purples, greens. Looking at them as a group, it is not entirely evident how to gather them up and redistribute the goodness into a good looking quilt top. This app takes all of that away and helps me to see the possibilities. I don’t know if you noticed but the programmer commented on my blog! Exciting indeed. I bought the app mid week. I stumbled around it and got to know it. When I got up to speed, which really hasn’t taken long, I posted my initial thoughts, and the developer responded to my blog directly! I like that. The first thing to do is to use the database! I headed over to my designers page at Windham Fabrics. I scrolled through and saved each of the largest images of my fabric line, 26 images in total. I imported these into the My Stash section. Then, I opened the My Blocks and started playing around, placing my designs in the blocks and saving. Then you move into My Quilts. By this time, you have used the features and you are cooking with gas! It doesn’t get much easier than this. 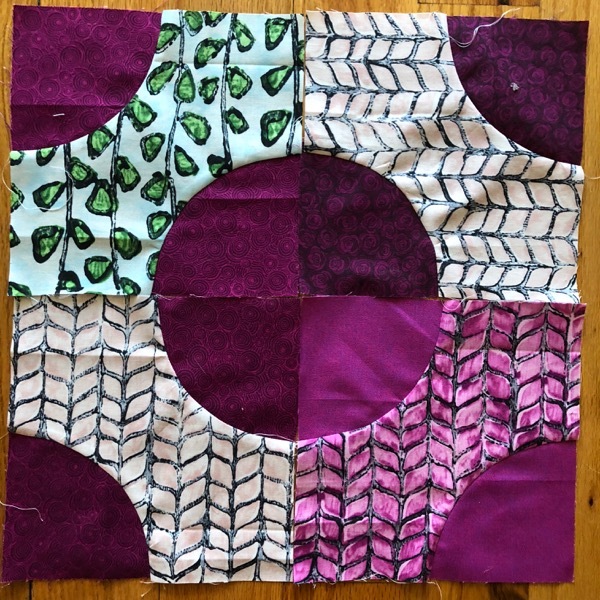 meadowlark quilt top challenge, thoughts and ideas. Half square triangles. 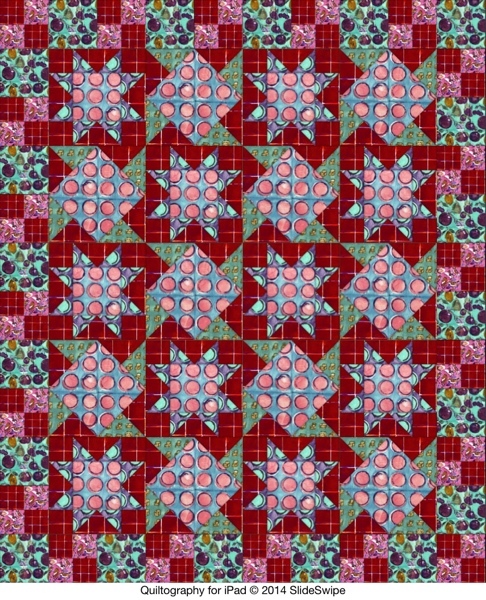 I hadn’t really ever considered how simple and effective half square triangles can be in designing quilts. Above are 72 possible uses half square triangles in combination. 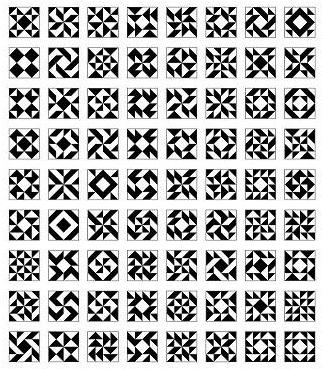 I return to this image often when thinking about making a quilt top. I like the idea of mega sized quilt blocks. I caught a fancy for the ease of making a 60″ throw sized quilt. I find this size to be easy to complete and large enough to have space to play around and have fun with. 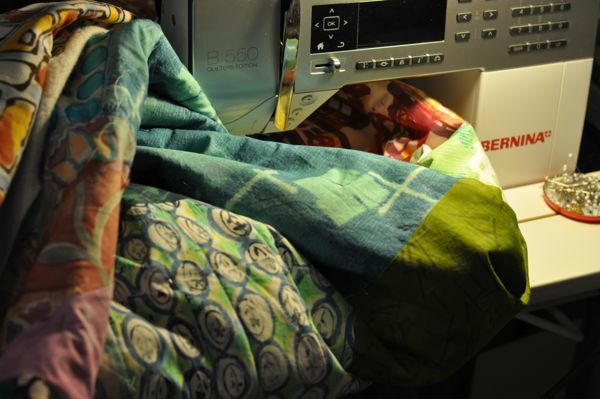 I love having a pile of quilts in the living room in winter time. We throw a few on the floor, snuggle, watch Tv. We each have favorite quilts and lots of pillows. 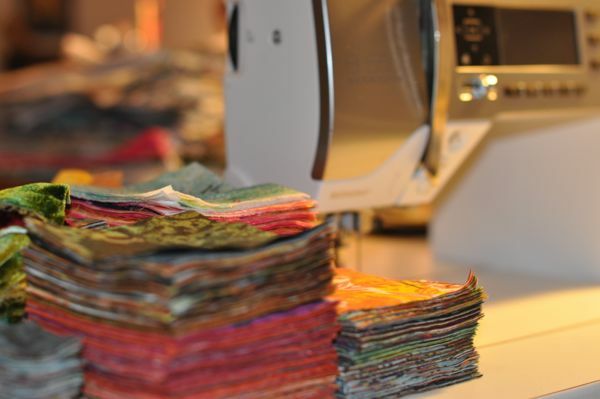 60″ quilts keep me making more quilts, it is my sweet spot size. Adding to the collection is great fun. Let us take a moment. Above. You see a 13″ MacBook Pro, custom. Wealth. Now, I can go mobil. To my favorite coffee shop. And you know what? I need to get out! I know how to work, head down, for hours, which has the tendency to turn into days, and… I find myself in pajamas for days on end. I love my pjs, don’t get me wrong, but. You get what I am saying. David and I bought new computers this year. I am moving in! And moving on! Literally. Yahoo! So anyway, my new Mac Book Pro 13″needed a tight fitting, Melly Made case! I am on a mission to learn to use the cloth I am printing. I have criteria, or maybe I should say, I am forming opinions, on how I want to use my cloth. I am focused on motif, color, ease of creation. I like to think about using my cloth with ingenuity and sometimes, striking differences in color and texture. I want the cloth to be the focus and not the quilt block design. 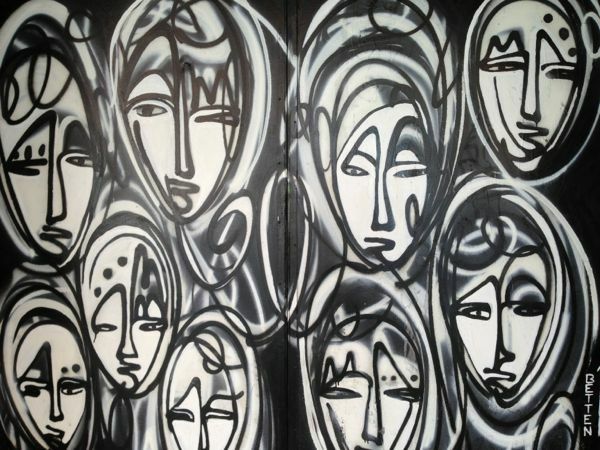 Motif as communication device. Motif as story telling. So I made this MacBook Pro 13″ carry case! I am quilt savvy that way! You see, we already owned a zippered, padded case for David’s old 13″ MacBook, but they keep making these dang things smaller and smaller, so my new computer needed padding to kit out the zippered case. I made this as tight fitting as I was able. I actually like it better than the zippered case, but computers need packaging when in transit, and a snug fitting transit is better than loose. 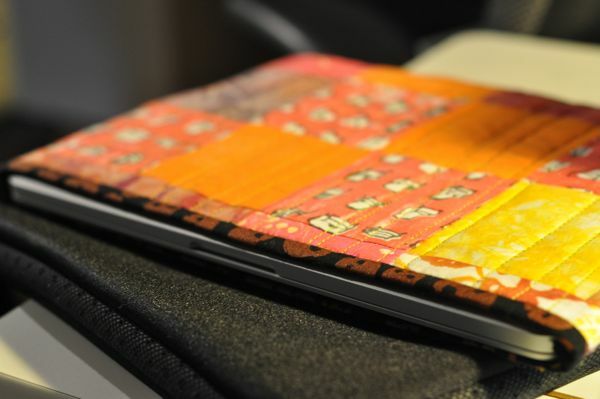 And now, I have a creative case using my own printed fabrics. Tada! I like being able to make do. Now, I can easily travel, update my blog, write (hopefully) my next book and I do not need to be plugged into my desk and tiny apartment. I can get out. 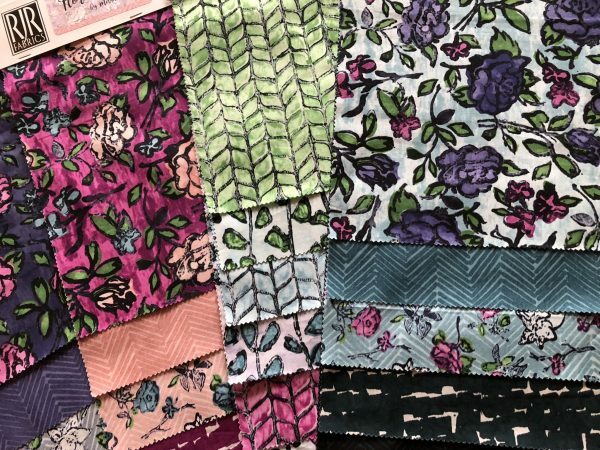 I love the concept of the jelly roll quilt, simply accepting what happens when you sew strips together, fast, simple, almost mindless piecing and quilting in order to wrap yourself in ‘warms’ while watching tv, during the cold winter months. You can purchase strips in prearranged bundles or cut your own, in color groupings to your liking. It is like opening a bag of potato chips and devouring them, except, you get a colorful quilt out of this! 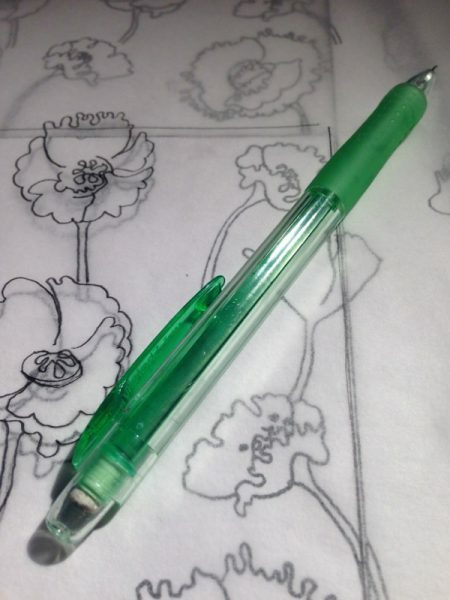 It kinda feels like cheating, but I like to think if it as a reprieve from the other creative stuff I do. It is ‘weekend quilting’ and I love doing it. 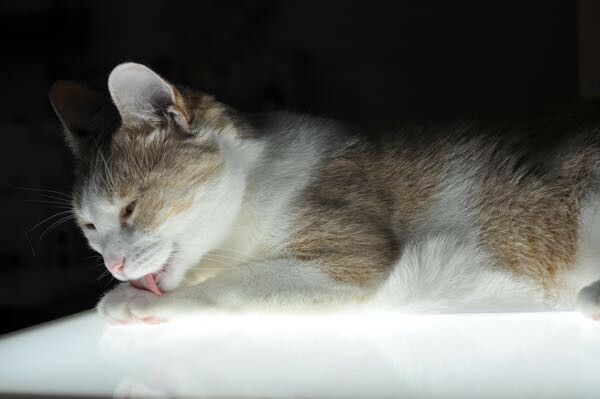 It really does relax me! I sewed this one up a few weeks ago, during my retreat weekend. Each gal pal gave two strips of cloth to each person participating, we could use the cloth at our discretion, so long as each person and their fabric was represented. This quilt top, both front and back, contains fabric from each of my gal pals. Later in the week, I will update the blog with a picture of the other side. 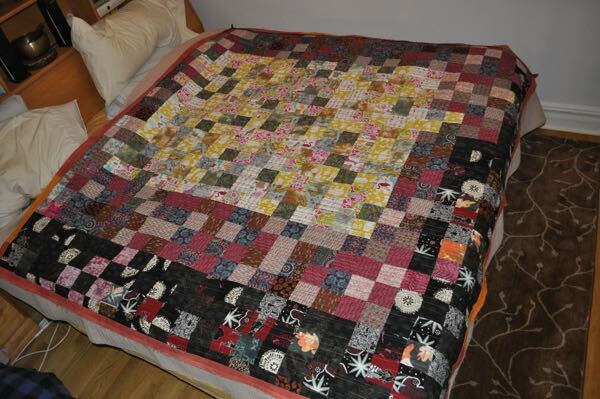 David and I have been using both of our jelly roll quilts to make ‘nests’ while we curl up and watch tv each night. What could be better? So In the spirit of easy, fun piecing and in an effort to start using my own hand printed cloth, I gathered some of my cloth and cut 60 degree triangles, pleasingly arranged. I sewed them together without thinking too much about color, placement or composition. I just wanted to piece and see how my fabric looks alongside each other in a mindless manner. This quilt top taught me to enjoy simply pieced blocks. The 60 degree triangle block is easy to cut, simple to piece and it looks pleasingly more difficult than it really is. It is a win-win sort of block. As you will see below, I went on a cutting tangent. This quilt top (I am on a mission to make two sided quilts, I want to stash bust!) 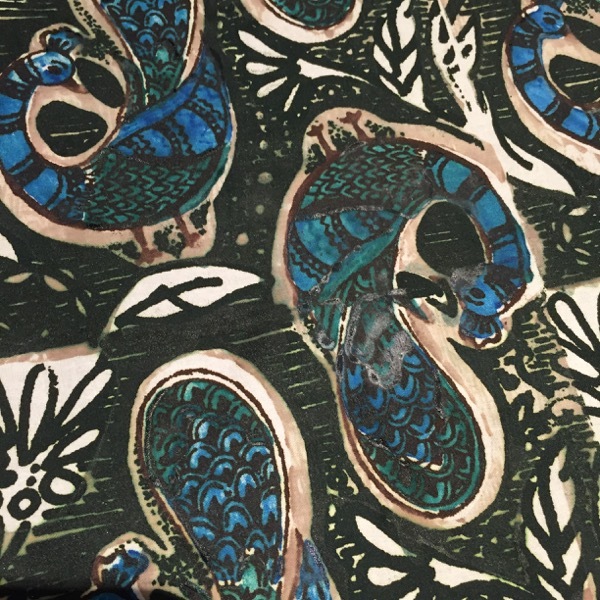 is predominantly commercially printed cloth, there are a few low water immersion semi-solids and a few of my latest multicolor prints, but they are in the minority. Anyway, this quilt top has really been an eye opening experience for me. The cutting tangent helped me to understand how to group colors while cutting so that sewing four patches together is pleasingly mindless and effective! See. I am on a mission to mindlessly make! I am in love with this quilt top, it is teaching me something. I haven’t heard the full story yet. The opposing side of this quilt top will be very similar but will feature my own printed cloth, predominantly. Anyway, I am piecing, machine quilting and sewing bindings like it was 1994! Hey wait, did they do that, like this, back then? Now, I am just making things up! My Mom gave me this sparkly, glow ‘riddled’, stained glass art piece featuring the Wonky Star. This is happy making. 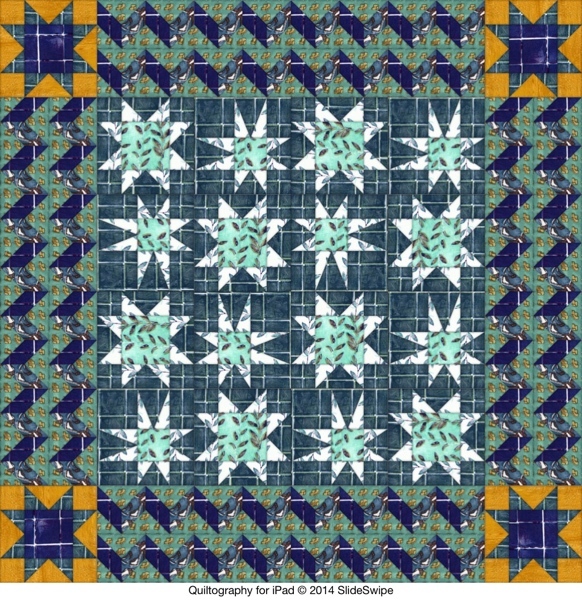 It links my Mom, Wonky Star quilt blocks and me! I love owning a piece of my Mother’s work, she has been working to improve her skills and sell her work, I love her dedication and her wares. Thanks Mom. 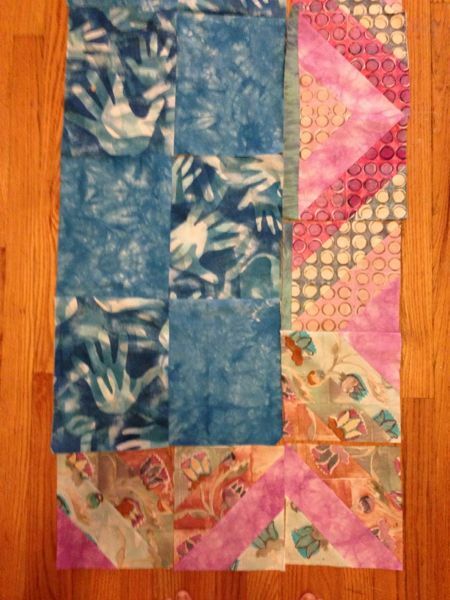 Of friends, jelly roll quilting and embracing long unused skills. This last year I have been in deep and total immersion into multicolor printing using Procion MX dyes. I have printed about 50 yards of cloth, believe it or not. And when you print that much cloth, it goes to say that you should also try to use as much cloth! At the same time, I have a back log of cloth that I have been printing and gathering for the last 10-15 years! I don’t consider myself to much of a stasher, not compared to my friends anyway, and I would love to get to the point where I am not stashing at all, but rather, making cloth per project/quilt and acquiring materials to fill out and finish said project. I have been sorting, cutting and stacking, cut squares. I mean, Damn! Look at these fat stacks! What you see here is my backlog fabrics, not the ones I printed this year. These older pieces of cloth work really nicely in padding out my current multicolor printed cloth and they also show me my progress as a dyer and artist. Win!! This quilt, a jellyroll quilt, I put together a few weeks ago, while at my twice yearly quilt art retreat. This quilt is filled with girlfriend love. We put aside our personal projects to exchange strips of fabric with one another and bang out a usable quick and dirty beauty. This quilt has one piece of fabric from each member of the group and then then some (!!!). Yesterday, Teri came to Brooklyn to help me bring my machine in for repair and to help me with the many, many projects that are piling up, with ‘just one last thing’ needed, before being able to call them complete. 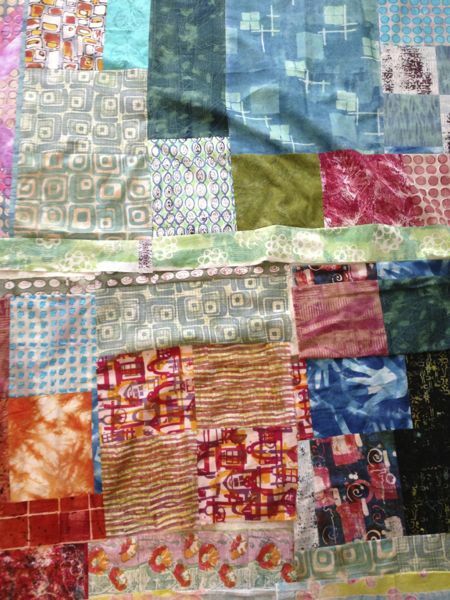 Teri Lucas helped me complete the jellyroll in many ways. 1. Teri helped me with trimming the quilt down, teaching me how to square it and what to square it to. 2. Teri cut and attached the binding (teaching me her methods all the way through, this is a 2″ French straight grain binding, I usually cut 2.25″ bindings [the straight grain part was my idea and is related to the cloth I wanted to bind it with]). 3. 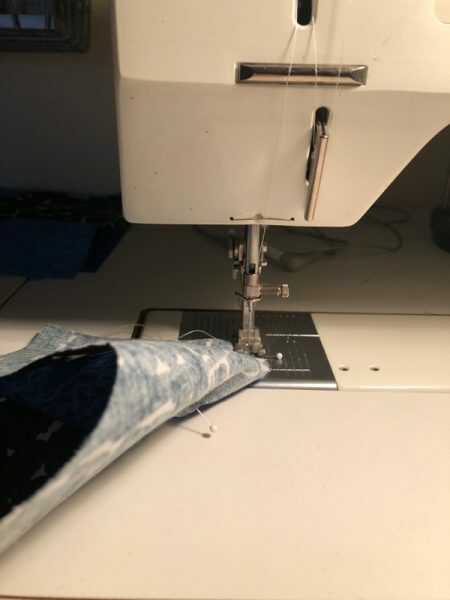 Teri gave me the fantastic idea of utilizing my local quilt store to cut quilts down and possibly even baste- NYC apartment living can really crimp a large quilts style! 4. Teri got me out of the house and made me re-member how important it is to hang out with friends, I tend to be a bit of a recluse and artistic shut-in. And then!! Last weekend, Stephanie Forsyth and her best friend Sally came to New York City. 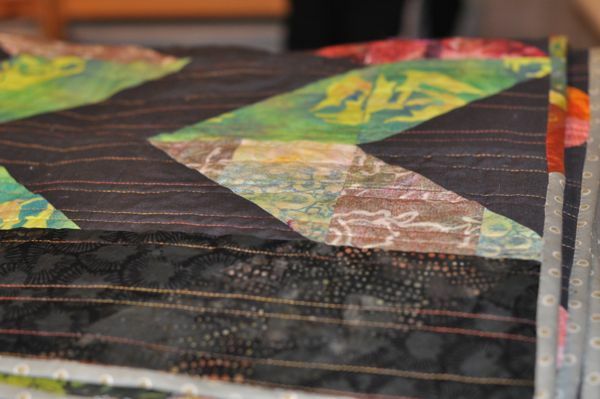 Beside walking up a storm, going to the Statue of Liberty, going to Carnegie Hall to see Handel’s Messiah, and eating and drinking while basking in our shared friendship, Steph hand sewed the binding on this quilt, made of my own printed cloth. Do I have awesome friends, or what? 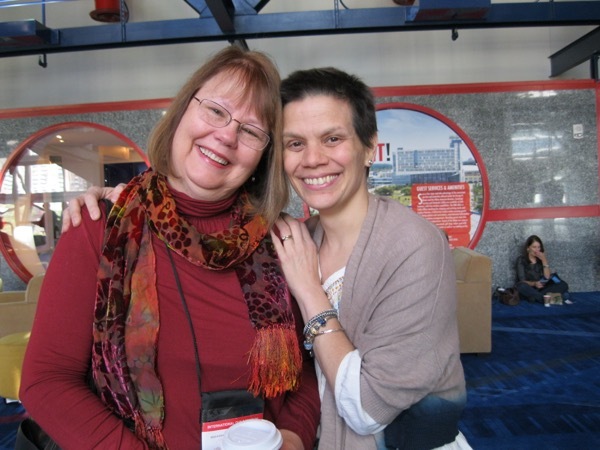 Want to know what I love best about both Stephanie and Teri, in addition to my retreat gal pals? I learn from these women. First, I learn what love, affection and friendship means, and I get to do it while dishing about cloth and fiber. I learn (relearn) that it is OK to ask for help. And my soul becomes fortified to what it means to have and be a friend. Teri put forth a challenge to me to try sewing the finished edge of the binding she applied by machine. I have never done this before. I usually sew that last bit by hand. Elizabeth (a member of my retreat group) did this and I liked the ‘Done!’ factor! I mean, that is quick! Do you think I should take her up on it? Let me know in the comments. 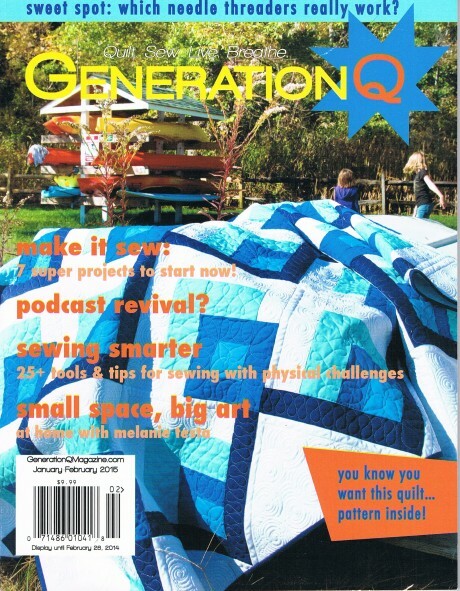 I started quilting when I was nineteen years old. I had taken a class at a local art center, it was great. I was still living at home and there was a great local quilt shop in my home town. I would go there and pull bolts off the shelf, think about how to mix color choices together, check out all the tools, read the books and of course buy stuff. This was an immensely informative period for me. It was while going through the meandering aisles of this tiny local shop that I came up with the idea of going to school to learn to become a textile designer. It took me six years to get a portfolio together and to muster the courage to apply to the Fashion Institute of Technology. When I did so, I created a portfolio with the requisite 15 pieces showing the depth and breadth of my artistic skills. But then , I also made my outfit-a silk blouse and a short skirt, portfolio case, I had woven the scarf I was wearing, and I might even have made the shoes I walked in with (that last part is a lie). After I took the drawing test, I sat with two professors to discuss why I wanted to become a student at F.I.T. I told them that I had fallen in love with quilting and quilting fabrics and that I wanted to become a textile designer and work with the quilting industry. They promptly reminded me that this was a very small subset of the textile market. They also told me that they were suprised that I did not actually want to get into the fashion department through the ‘backdoor’ of Textile/Surface Design. They told me that they rarely did this and did not know if it was legal, but they accepted me right then and there, the acceptance letter that came in the mail a few weeks later was a formality. 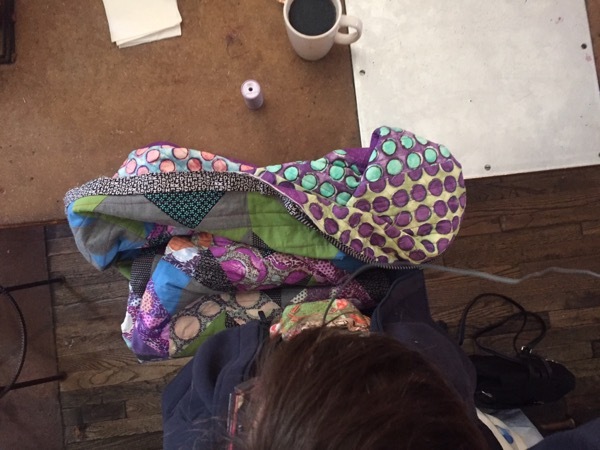 After I left school, I blind called every quilt oriented textile house in New York City and I landed a job at a well loved and respected quilting textile house. Unfortunately, my skill set at the time was not up to the hopes of the head designer and they let me go after a six month period. Ouch. I went on quite a few interviews after that and I must say, the fashion industry (I had cast a wider net than just quilt textile houses at that point) was cut throat! I went on one interview where they asked me to take work home three times before rejecting me because my clothing was not up to their standards. So I packed up my bags and took a job as a poster restoration artist that was based in my home town. I learned a heck of a lot while working that job. In retrospect it was quite an artistic life changer. I restored posters by Lichtenstein, Warhol, Mucha, Lautrec and on and on. I learned color mixing, I worked to deadline, I used every off hour to take workshops in surface design and quilting and to improve my artistic skill set. All while continuing to want to be a textile designer. Then I was diagnosed with cancer and had a lot of time to think about what I really want out of life, and having a line of fabric with my name on the selvedge is still quite high on the list. This year, I have been working on creating a portfolio, putting motifs into repeat, printing the ideas on both paper and cloth, and now making these cloth samples into quilts and quilt tops to show perspective textile houses what my designs might look like in action. I have bought tickets to Quilt Market and I am going to try to make this dream a reality. If I am unable to woo anyone at Market, I have also come up with a Plan B- there is a trade show here in NYC for the broader market this coming winter. I have finally gotten to the point where I am using the cloth I have been printing all year long. I am very excited about this for several reasons. The most surprising of which is, I forgot how very much I like piecing and quilting. 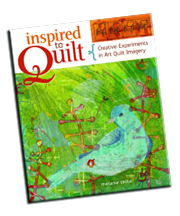 For years I have been ‘art quilting’, using thickened dye to create one of a kind wall art in a figurative style, as I wrote about in Inspired to Quilt . Over the years, I stopped making surface designed cloth for the fun of it, while looking at my storage bins and wondering for what or why I should keep them. Now, I look at those bins and I see potential. I want to tear through these bins and make throw quilts. I want a stack of throws, folded, stacked, pretty and ready for use! The photos you see here are the back of a quilt. I like two sided quilts and I think the backs should be as fun as the fronts, although I think backs should also be quick and easy. 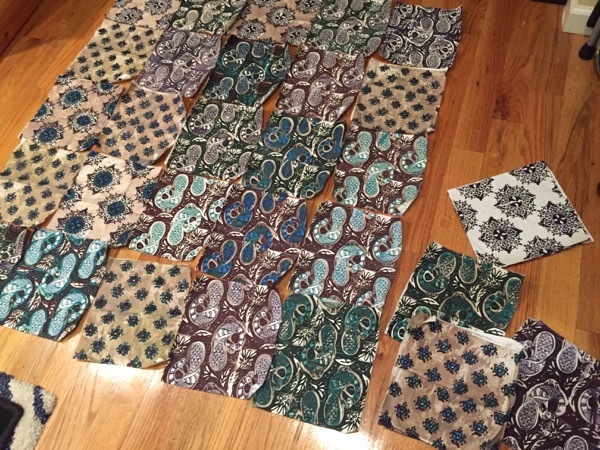 Because I have been focusing on multicolor printing this year, I have a criteria for what I would like to accomplish while piecing and quilting my cloth. 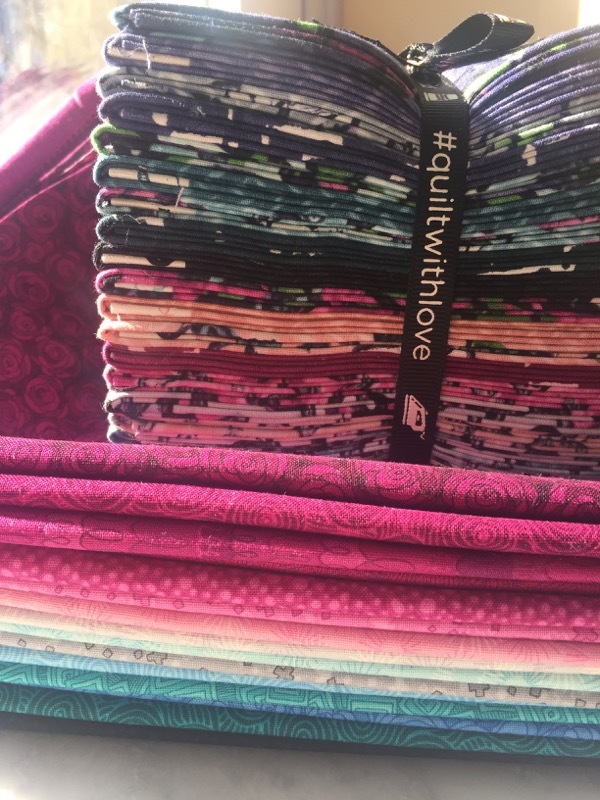 I want the cloth and my designs to really show themselves off, it takes commitment and time to print cloth and I want my quilts to really show my cloth off to its best advantage. I am exploring different quilt blocks and settings to do this. Right now I think it is a good idea for me to work with bigger blocks of a simple nature, like 6″ half square triangles, 1000 Pyramids. I bet as I cut, piece and quilt the throws I am working on now that I will begin to see my way through the quilt block forrest a little better. I am oh-so-happy to say, today I am heading over to Victoria Findlay-Wolfe‘s house for a day long class in 15 Minutes of Play . This book has been following me around for weeks, if not months. Victoria uses a technique she calls Made-Cloth, where she sews cloth together improvisationally, and figures out how to use it later. For my part, this is useful in that, because I have printed all of my own cloth, I want to use every last bit of it. Many of my multicolor printed cloth pieces are quite small, so I have been making Made-Cloth with it, but I am sticking with the same prints and colors, rather than using many prints in one Made-Cloth piece. Brilliant. I will post and let you know about what I have learned in Victoria’s class. I look forward to meeting quilters, I can’t wait to see the synapse connections I make. I love learning. 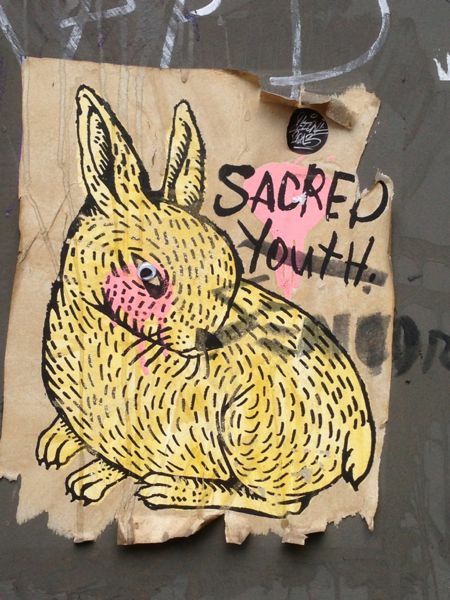 I uploaded this image because I like the hash marks. 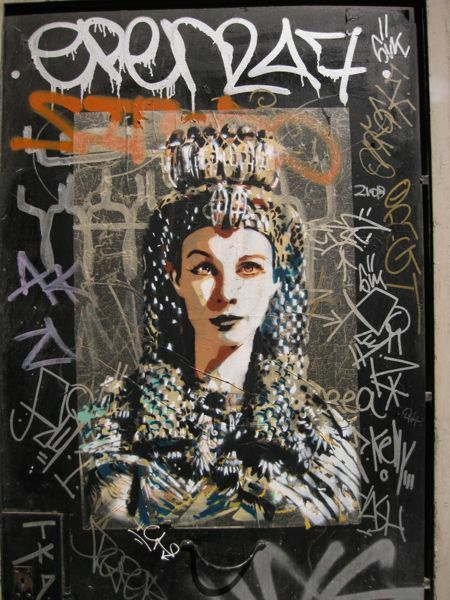 I also really like graffiti and poster art, so there! Enjoy. I have been seeing pattern and dots everywhere. I love them. It started because I bought a copy of Victoria Findlay Wolfe‘s book 15 minutes of Play , and I fell in love with one of the quilts displayed in her book. The quilt is called Dot Calm, and was made by Karen Griska. 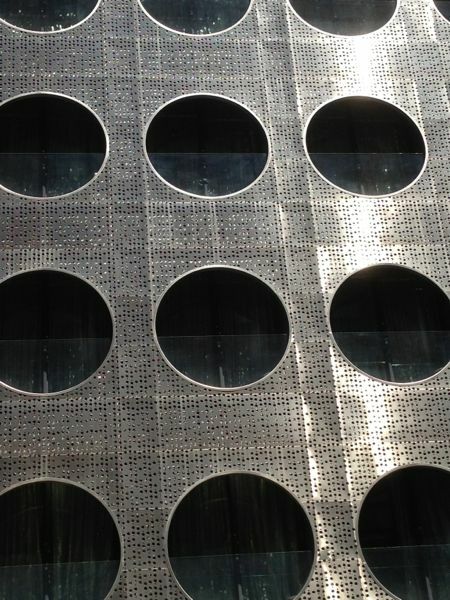 I have been seeing dots everywhere! Today while traveling the subway, I saw a man wearing a printed purple dots in an irregular pattern and then I saw a woman wearing dotted tights! And being a Mad Men fan, I have to say, Season 6, Episode 5 had Peggy wearing a red polka dot pattern seen here (scroll down). 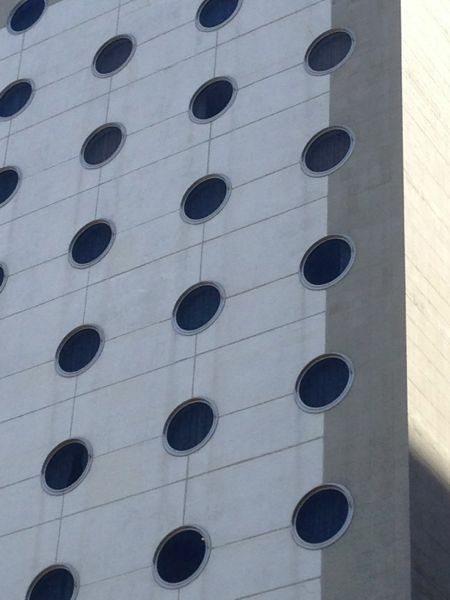 I have been daydreaming about those dots since I first saw them. Anyway, dots are all the rage in the land of Melanie Testa. This graffiti could be considered a dot. I know it is a stretch, but as I said, I have dots on my mind. Lots and lots of dots. This week, I strolled the aisles of Mood and I saw more dots. 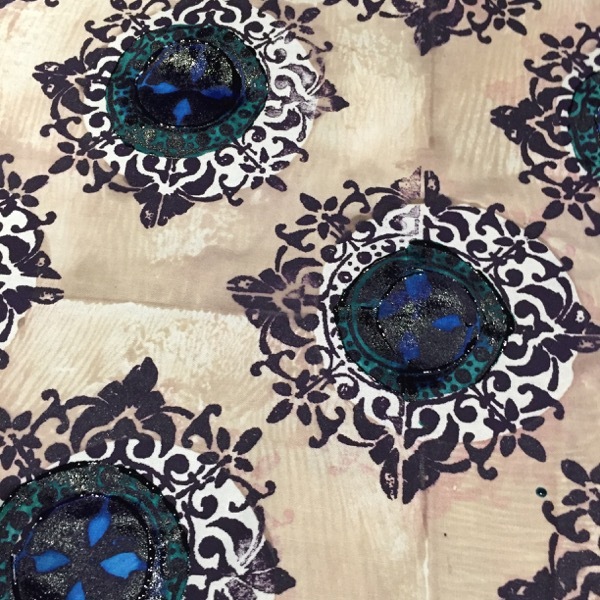 So, I have been printing dots, and have begun to sew and quilt while using them. I have not honestly quilted in years. 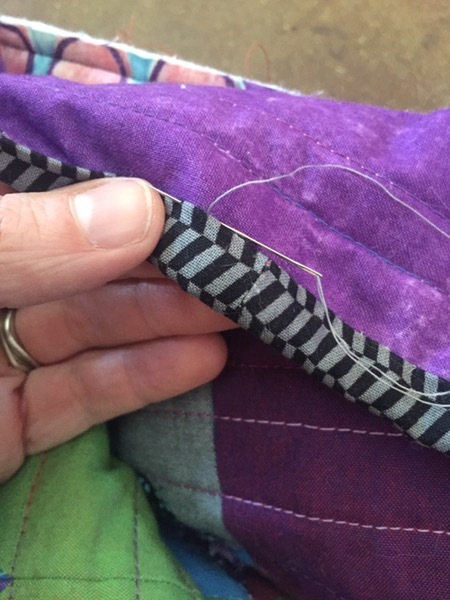 I love to seam and piece. I love sewing a scant quarter inch seam. I love the meticulous nature of wanting to do a good job, of compensating of a short seam, I love trimming the cloth and ironing the seams open. I love the smell of the iron, even more I love the smell of the sewing machine after hours of having it on-it smells like warmed oil. I love piecing. I forgot all of this. 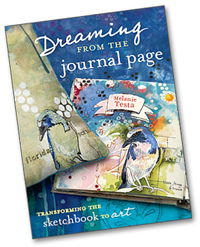 I have been visiting The City Quilter and hesitantly looking at the newest books on the market. Books with a modern quilting flair. I am hesitant because I do not want to be too heavily influence in the direction of another persons style. I would like my own style to emerge and formulate. The overarching current day method, from what I can tell, is improvisational. So, I embrace dabbling and trying this block, that stripe, a little bit of solids, lots of printed cloth. After printing so much cloth over the years, I find using the cloth to be invigorating and inspirational. I remember printing each piece, the studio I used to print it in, I track the learning progression from one piece to the next. I am wowed. My brain is quiet. This is good. I am putting this image back up on the blog. I took it while we were in Barcelona, Spain. This image has changed the trajectory of my creative life. This helped me to see the possibility of multicolor printing and I am forever grateful to have seen it, had a camera and to have taken a photograph of it.